This fly is made from crystal flash, grizzly hackle and Loon Outdoors clear cure acrylic. I linked to this in the last issue, but here is the recipe from my website. Lay a thread base on hook. Wrap back slightly onto the hook bend. Take four to five strands of Krystal Flask. Fold it in half and cut. Fold in half and cut again. Tie KF along top of hook shank, extending beyond the hook bend to simulate antenna. Make mono eyes from 40-50 lb mono by burning ends. Tie mono eyes on top of hook shank, directly above the barb, using figure 8 wraps. Bend the eyes up and back. Secure in this position with a dab of acrylic and cure it. Tie in the hackle feather. Spiral thread to just behind the hook eye. Palmer the hackle feather forward. Tie off. Cut the barbs of the feather off on the top side of the hook. Take about ten strands of KF, fold in half and cut. Place KF so approximately 1" extends beyond hook eye. Tie in place where you tied off the hackle feather. Whip finish. Secure with a dab of thin UV acrylic. Color the end of the KF with a permanent marker where it extends over the hook eye to simulate the shrimp tail. Cut off excess KF. Run a bead of thick Acrylic along top of hook stopping at the eyes. Spread a small amount of acrylic along the bottom, sides and top of the KF which you just tied on. On the bottom of the KF only spread the acrylic as far as the eyes. On the top of the KF, spread the acrylic approximately ½" farther than the eyes. This will form the horn. Hold acrylic soaked KF along the top of the hook shank, and cure with UV light. Cut off material that extends beyond the eyes at an angle to simulate the horn. Take the fly out of the vise and spread a thin layer of thick acrylic along the sides and top of the body of the fly to build up a natural looking shrimp body. Move the fly around to distribute the acrylic evenly along the body of the fly. When it is distributed evenly, cure with UV light. Repeat step 8 again if necessary. Color eyes with black marker. I will publish the recipe for the Ultra Shrimp next month. This ultra shrimp is tied on a size 2 Gama B10S stinger hook and it is a little over 3" long. It is light and not very air resistant. This little fly has landed all the triple tail so far this year. If you get it where the TT can see it, they will usually grab it. 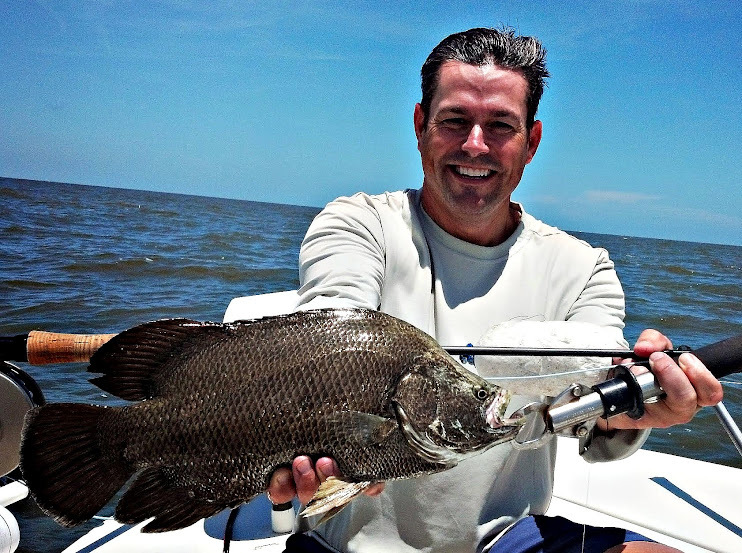 Triple tail are notorious for short striking and nipping off the tail of live shrimp. I added a stinger hook to the tail of my pattern. It works great. I still have not tried it on trout, but they are sight feeders, and I know they will eat it. Stay tuned for how to tie it next month. October: 4-10 16, 18-22. Oct 5,6 and 7 are booked. The first of the month should be better. Water tends to get a little too cool the end of October. I attended the Southeastern FFF Fly Fishing Festival in Cullowhee, NC last month. While it was a long drive it was well worth it. I taught a class on Accuracy. I had a chance to share ideas on teaching fly casting with some of the best Master Casting Instructors in the Southeast. I was taught some basic spey casts by Ally Gowans, the leading Spey Casting instructor in the nation. I tied flies. I visited with fly shops and suppliers. I took a class on distance casting and worked out some of the problems I have with my cast. Now to practice to develop muscle memory so I don't fall back into bad habits when I am on the casting platform and a 10 lb red fish or 100 lb Tarpon is coming down the flats. Any of you who have fished with me have heard me talk about the importance of practice to develop automatic muscle memory. Now to see if I can practice what I preach. 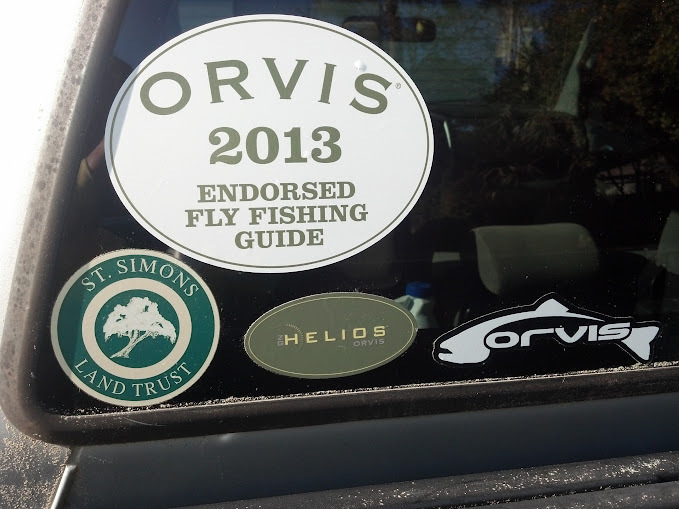 All in all it was three days of complete immersion in Fly Fishing in the Mountains of Western North Carolina. Who could ask for more? The Southeast Council will hold the Festival again on them campus of Western Carolina University next year. You should make plans to attend. April and May have been hot and cold. The red fish are now in their summertime patterns and holding in their summer time flats. One thing hasn't changed is the wind. We are still dealing with prevailing easterly winds at 10-20 mph. Yesterday a fellow guide out of Jacksonville and myself went in front of Jekyll to look for triple tail. The wind came up 25 from the Southeast, and the seas were 2-4 feet and completely chopped up; not the easiest conditions and not conditions I would take a client into. We found about a dozen small triple tail and managed to fool two of them with a fly rod. These fish should be around a few more weeks. The key is whether or not the shrimpers trawl near the shore of Jekyll when the near shore shrimp season opens on June 11. If the shrimp aren't there, they won't trawl, and the triple tail will stay happy. We caught some larger triple tail earlier in the month. At times in April and May the red fish had major cases of lock jaw. We saw hundreds of them in low tide schools, but they would not bite anything. We did manage to coax a few into biting. 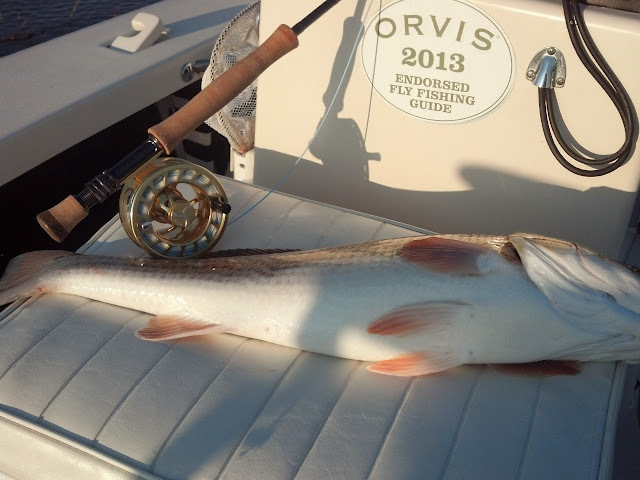 Here is the second largest red fish ever caught by one of my clients; 11 lbs, 31 inches. I had a cancellation and managed to fish one of the flood tides on the full moon in May. 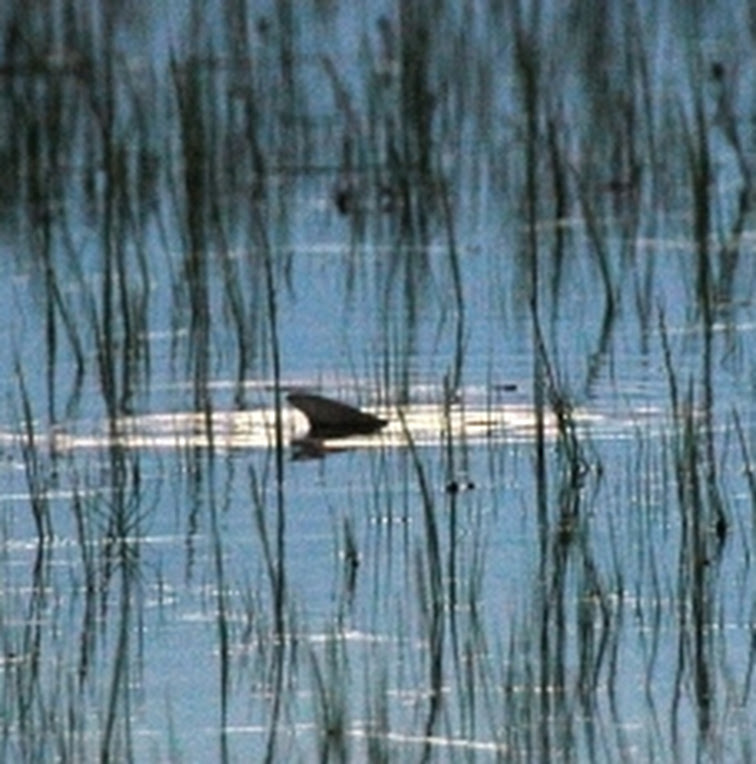 I went to a flooded grass flat fairly close to the Marina. I had shots at five tailing fish and managed to land one. One for five on tailers (20%) is a pretty good percentage. I fished a flat I dubbed "Hawg Heaven" last year, and this year it is living up to its reputation. The one I landed was 27" and about 8 pounds. These fish will be tailing all summer when we have the right tides. I am booked for June for tailing fish, but I have some open dates in July-October. I have been told the big schools of Jacks are off of Jacksonville. That is awfully early, but they may be up here sooner than August/September. Good news, Capt Larry is out and about again. While he is in a wheel chair and requires care, he is coming into the shop fairly regularly. When you are in St. Simons, make sure to stop by the shop to see if he is there. 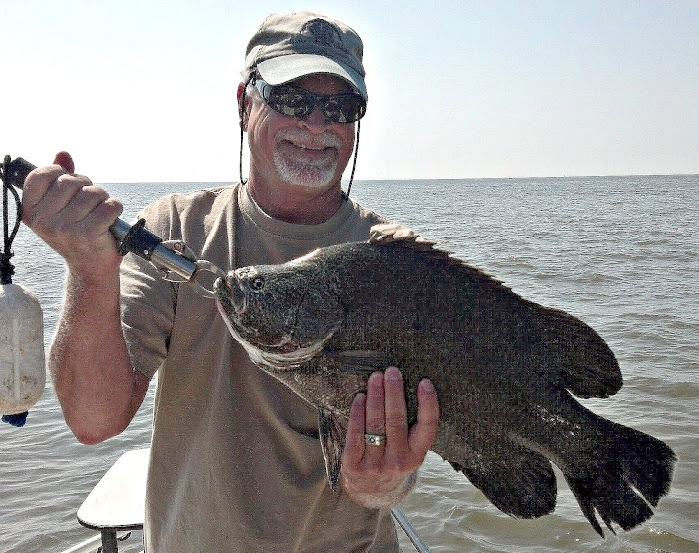 St. Simons Ouftitters has a basic selection tying supplies, hooks, a good selection of fly lines, reels and fly rod/reel combos ranging from those for the most budget minded to the finest available. They have the latest Columbia line of high tech shirts and pants that act like air conditioning. That will come in handy in a few months when the dog days of summer arrive.